Hickory king sweet corn is a corn plant often grown for roasting and for making flour, grits, hominy and cornmeal because the kernel skin is easy to remove by soaking in water. 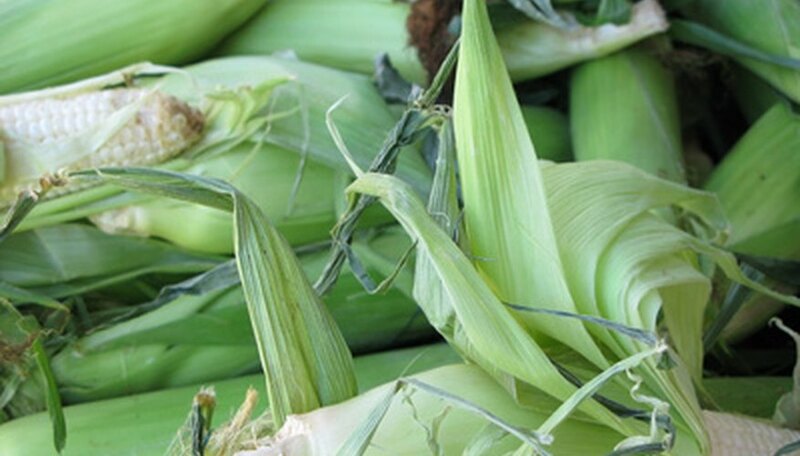 Hundreds of sweet corn varieties exist, and hickory king is actually considered a specialty field corn, widely cultivated in the eastern United States during the late 1800s. Hickory king sweet corn is a taller-growing corn variety, reaching up to 12 feet tall and producing two 12-inch ears per stalk with flat, white kernels. Plant your hickory king sweet corn in the spring when the soil has warmed up to at least 60 degrees Fahrenheit and all danger of frost has passed. Select a planting site in full to partial sunlight and with moist but well-draining soil. Plan at least three rows in which to plant your sweet corn, with the corn plants spaced 10 to 15 inches apart in the row and the rows spaced about 3 to 3 ½ feet apart. Insert garden stakes and measure to visualize and set out the planting rows. Prepare the soil at the planting site by removing all weeds or grasses from the soil and tilling the soil to a depth of about 12 inches using a pitchfork or rototiller. Loosen the soil well at the planting site. Spread a 2- to 4-inch layer of organic compost or well-rotted, aged manure on the tilled soil bed. Mix the compost or manure into the soil to a depth of at least 6 inches. Plant the hickory king sweet corn seeds in groups of two or three, spacing each grouping about 10 to 15 inches apart. Plant the seeds about 1 inch deep into the soil. After the seedlings sprout, you’ll need to select the strongest seedling in each grouping and remove the others. Water your hickory king corn seeds evenly each day to supplement rainfall until the seeds germinate and begin to sprout. After the corn begins to grow, water the plants deeply down to the root area, to wet the top 8 to 12 inches of soil, once or twice each week. Feed your hickory king sweet corn 1½ pounds of ammonium nitrate per 100 foot of row when the plants are about 8 to 12 inches tall. Spread the ammonium nitrate beside the rows to “sidedress” the corn plants. If you have a smaller space to work with, you can plant "double rows" to increase your yield per square foot. Make double rows that are spaced about 10 to 12 inches apart, with about 3 to 3½ feet between each double row. You can harvest your hickory king sweet corn when the kernels are still in the "milk" stage, meaning that the kernels are firm but are easily punctured with your thumbnail. Look for the silk in the corn ear to begin to turn brown for a tell-tale sign that the corn is ready to harvest. Don't allow weeds to take over your hickory king sweet corn, especially when the corn plants are young. Use a hoe to remove any weeds around your corn plants as soon as they emerge. What Is the Difference Between the Germination of a Bean Seed & the Germination of a Corn Seed?